No prior painting or drawing skills needed. This course is designed for adults of all ages. Join me for a 2 day workshop located . Mix and meet like minded creative souls who would like to create a unique piece of art. This workshop is designed to take you through a fun journey with your art and discover the inner artist along the way. We take our inspiration from mother nature. Learn the process of mark making, painting from the heart and following your intuition. Beginners I absolutely love – you will be so amazed as your unlock your inner artist and express your creativity. All levels are welcome. Tip – you must be prepared to let go, be brave, go with the flow. A weekend of fun, laughs and new friendships. 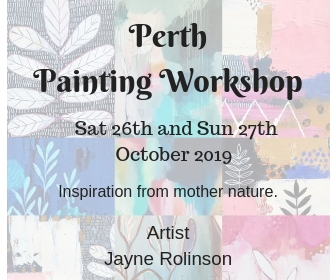 I am always incredibly honoured to be part of a students journey into re-discovering their path of creativity.. ..
Two days of creating your masterpiece. How awesome is that. Do it for you. Because you are worth it. 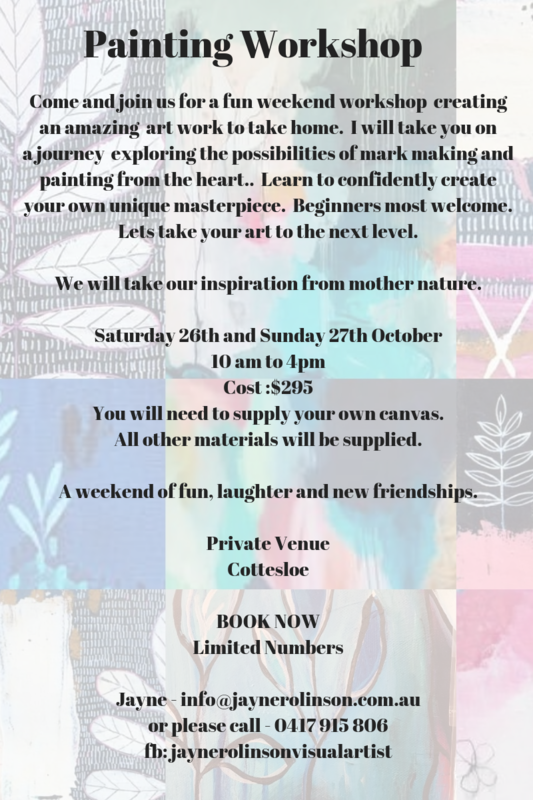 This course is designed to bring your creative side out to play. Yes – you will create a beautiful intuitive piece of art. Explore the possibilities of painting in layers. The power of symbols, composition and colour in your work. Take home a large finished art work to hang so proudly on your wall. Yes…. how awesome is that! A unique insight into your own creative process and where your inspiration comes from. Step by step guidance from a professional artist who believes on having fun along the journey. Make new connections with other creative souls. Fun, fun and so much more. Canvas. Any size that will suit your needs. Large or some small. Can be a new canvas or over painting an old . I normally paint two canvases at once, While one is drying – another is on a journey. I would like students to complete one finished artwork to take home. Please bring lunch. Coffee/tea and light refreshments will be provided. Please bring an apron or clothes that can have a little paint on them!